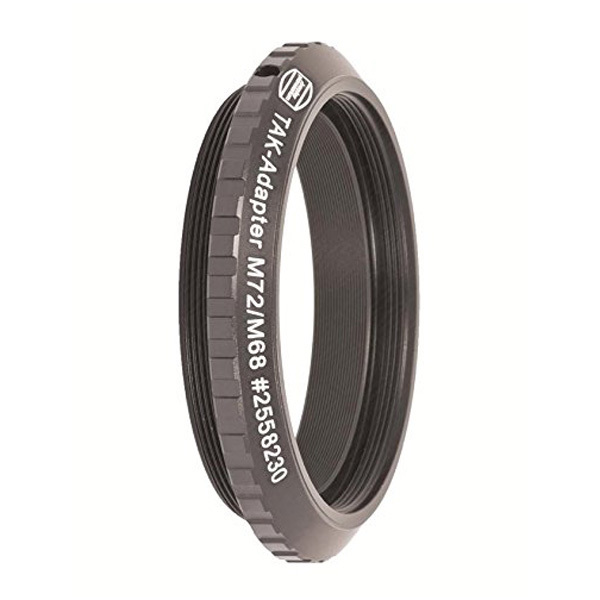 Baader Planetarium's 2558230 / TAK-M72 adapter has an M72 male thread for Takahashi telescopes on one side. On the other side, it features an M68x1 female Zeiss thread. This allows you to use other M68 threaded Baader accessories such as the Ultrashort 2" Eyepiece Clamp (# 2458196) on Takahashi OTAs with the M72 thread. This Tak M72 adapter together with the Baader 2" Four-in-One adapter (# 2458190) results in an extremely short 2" eyepiece holder for a Takahashi refractor.